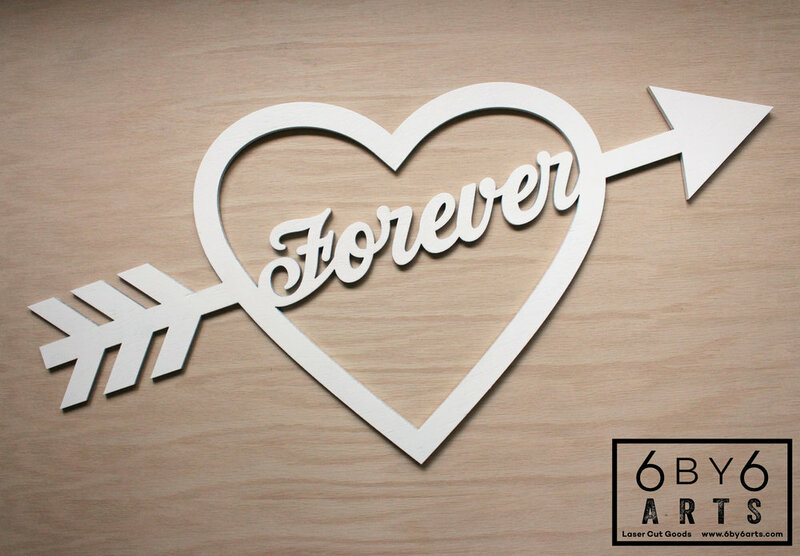 We recently had the great pleasure of creating a custom two layered wood sign for Pics for Promises. Pics for promises is a whimsical love-themed photography project built around the idea of giving back. We are a husband and wife team fortunate enough to have a healthy family with a safe place to live, food to eat, clean water to drink, and access to doctors. We realize this is not the case for everyone, so we are using our creativity to provide a small bit of help to those less fortunate. Opening this website allows us to expand our reach, giving people the opportunity to purchase heart pics, and in turn give back to the community. Not only are we donating 25% of all profits from online sales to charity, we are using additional profits to fund the Street Hearts portion of our project, from which 100% of proceeds go directly to a charity of the donor's choice. Pics For Promises will also be working with local charities to sponsor events and help raise much needed funds. Custom layered sign for Pics for Promises. We thought it was an absolutely adorable project they've undertaken and were more than happy to create this custom sign for them. This sign is two layers and a total of three colors. 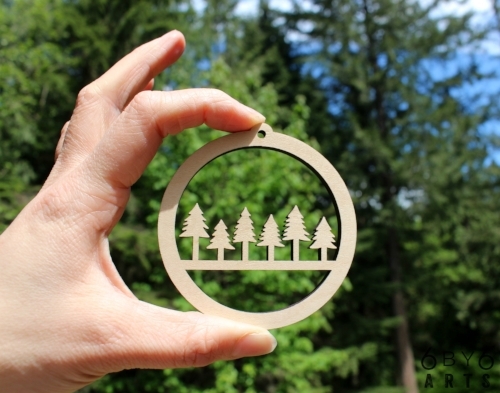 It measures 18" in diameter and 0.5" thick. Being two layers, it was one of the more uncommon sign requests we've had. Most love the minimal simplistic look of natural engraved wood. Which is absolutely lovely. But this style of layered sign gives a look of depth and splash of color that we love and find aesthetically pleasing. We carefully placed each inner cutout piece within the wording by hand (with assistance of tweezers) and securely glued it down. It turned out absolutely lovely and Pics for Promises posted a super cute photo of the sign being held on their Instagram account. Fun and lovely project for a fun and whimsical company-project. Be sure to check them out! A few months ago Kimberly from The Lettermate contacted us hoping we'd do a small project for her company. Some simple trade show signage. It was a simple job and the end result looked great! We were totally thrilled that she hit us up again for a large scale version (15" x 12") of her product for teaching purposes in her instructional classes! Oh, in case you're wondering what exactly The Lettermate is, its an awesome hand lettering tool for addressing snail mail envelopes. We will be picking up a couple for our own wedding next year. A few of you fellow Pinterest junkies might have seen The Grommet sharing info about The Lettermate. Like our work - The Lettermate is made in the USA! We love projects like this! It doesn't hurt that the lady behind The Lettermate is pretty stellar too! Beer Me, Booze Me, Wine Me! Why do we call it The Holy Trinity? Well, I'm sure we're not the only ones who've spent some time "praying to the porcelain god". I have personally been known to say all three of these at any given time. It's just so effective when someone is walking to the kitchen/fridge/refreshment area. Beer Me! Booze Me! WINE ME! Hey, you can't get what you want unless you ask for it right? State your preference in your home or a special event with one, two or all three of the this trinity. Speaking of trinity, we have a little coupon code if you want to own all three. Enter coupon code (TheTrinity) from now until Thursday July 17th, 2015 and save $5.00 off of $45.00 purchases! So what's your preference? We did consider Coffee Me, but let's face it, no one is in the mood to talk until the first cup of coffee is finished. Its just an unspoken understanding. We very excited to announce that Wholly Craft in Columbus, Ohio is our very first midwestern stockist! 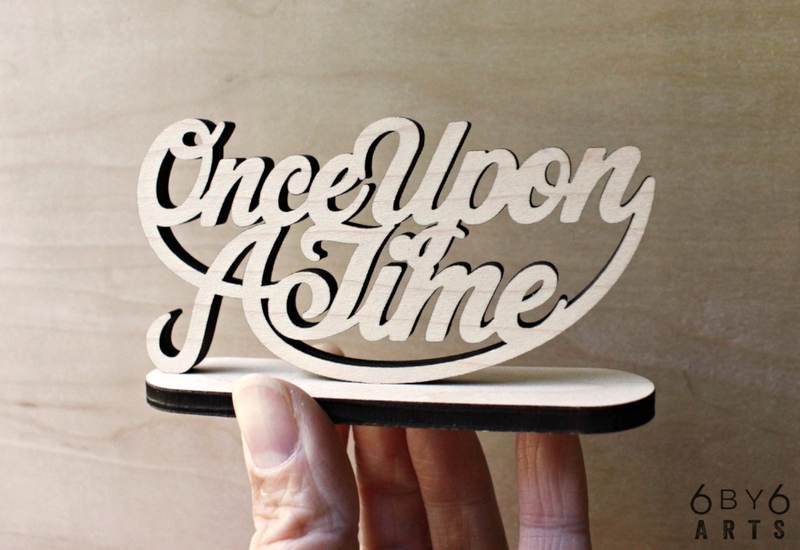 They have an assortment of our laser cut wood signs (as pictured above). As well as a very special laser cut mini Ohio state shaped chalkboard magnet. Ohio state shaped mini chalkboard magnets. We whipped them up special just for them. We're both born and raised PNW Lifers, but I actually have midwestern family roots. Fun fact, like many soldiers who fought in the American Revolutionary War my many great grandfathers ago was awarded land for his service in the war. That land happened to be in Ohio. If you happen to be in the Columbus area be sure to stop by and check them out. 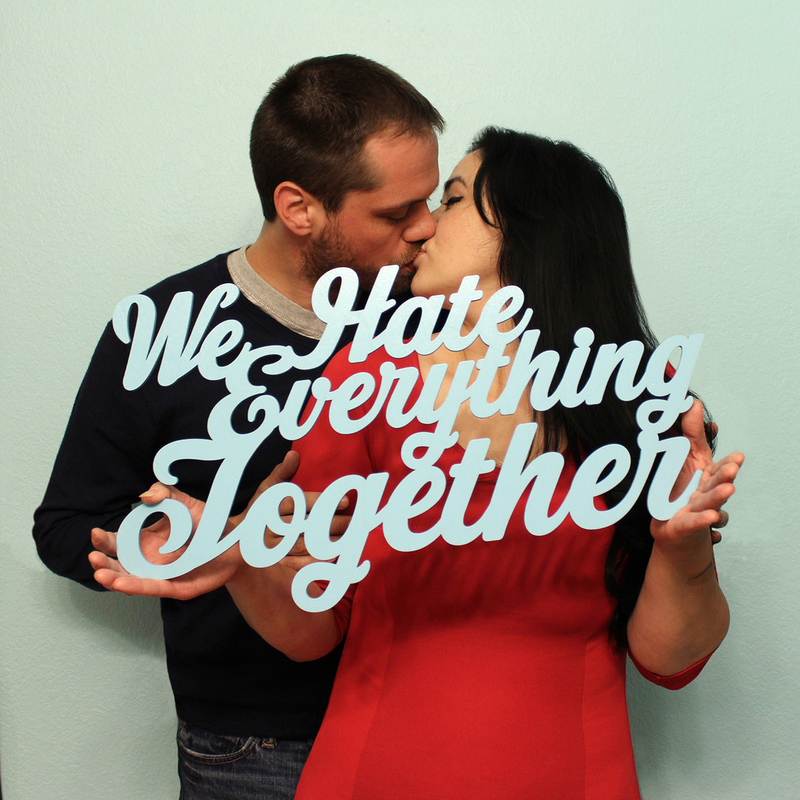 Yesterday, we quietly listed a sign with a wider appeal than our "We Hate Everything Together" signs. Like all things we do, it starts with a doodle. My doodles are often crazy and more elaborate than they should be. This one wasn't too bad. As you can see there are some changes/development notes that occurred with this. I was thinking of a classic and simple design. Something that could be multi purpose. Truth be told, I'm not a Valentine's Day girl. I'm also not a flowers and open the door for me girl. I'm a beer and ramen lady, hey it's hard to hate on someone who brings you food to eat. But I do like sweet little things like this. It could be for any day. After all it's appropriate to convey love for someone everyday. "Forever & Ever Babe" was my original wording. John then morphed into "Forever or Whatever", which we all found hilarious but we get enough "evil side eyeing" about our "We Hate Everything Together" stuff. So we decided on "Forever". We hope others will too. Not just the sign but after you've lived a bit and grown into yourself we hope you all find someone to fill your heart up for forever. Lovers, friends, puppies, whatever floats your boat. Twin Peaks is one of my all time favorite TV shows. I'm thrilled that there will be a revival season in 2016. One of my favorite quotes from the series is: "You know, this is - excuse me - a damn fine cup of coffee...". When Special Agent Dale Cooper sits down for breakfast at The Great Northern. Whenever I come across a damn fine cup of coffee that scene rolls through my mind. Additionally we added some icosahedrons (I LOVE saying icosahedrons!) to our 2014 ornament line. I hope you've enjoyed my evening's rambling! John and I are engaged to be married. Separately, we've done a lot of living before we met. We've both been married previously, had children and grew as people individually. We met in somewhat unusual circumstances that involves a ruben sandwich, a childhood friend and a trip to Whidbey Island. Through John's persistent chasing our discovery of each other was extremely entertaining. Not being naive to what being in a relationship was we discovered we had a lot likes in common. We've watched a lot of the same strange movies, our individual OCD tendencies complimented each other and we genuinely like each other's company. But more importantly, we discovered we "hated" a lot of the same things. Which can be more important to a relationship. Sharing the same views on politics, religion, health issues, daily routines, bad television, music - whatever you can think of. It's important to be on the same page with things that are really important to you.